I know mobile is the future. To some degree I experience it and participate, for example through Twitter. I use Twitter both personally (@LisaColton) and professionally (@DarimOnline), and use Twitter clients on my iphone to read and post and connect all over the place. The last 48 hours at NTEN have perhaps been the most prolific to date – there’s so many excellent nuggets of wisdom here. (Check out my twitter stream, and the #09NTC steam from all participants). But as I think about mobile fundraising campaigns, etc. I remain somewhat skeptical. Let me revise that: I feel that the technology is still “in the way”, and as Clay Shirky said this morning, “the tools don’t get socially interesting until they get technologically boring.” Mobile technology just isn’t boring yet, but it is moving from awkward to interesting. 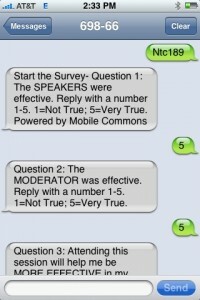 NTEN has engaged Mobile Commons to set up a text message based evaluation system for this conference. That’s right, you TEXT your rating and comments, rather than writing it on paper. Less paper, easier to compile the data, super convenient. I was at first confused how it would work, but then I just went for it — texted the session number NTC189 to the short code they gave us 68966. Half a second later the first questions popped up. I entered my rating and hit send. The next question. IT WAS SO SIMPLE and satisfying. Success. I do expect that it will take some time before the masses are comfortable with such uses of mobile, but the future will be here shortly, and thus it’s useful for us to learn what the early adopters are doing, and start to dip our toes in the water. Other examples shared here have been integrated with video, advocacy campaigns, fundraising and more. What’s the lesson? Though you may not be using mobile campaigns now, it is the future, and thus you should be collecting your constituents cell phone numbers now. They will come in handy a few months or years down the road. NTEN Conference or Membership – FREE! Give Us Your Best Social Media Story. Posted on March 18, 2009 by Author Lisa Colton Leave a comment on NTEN Conference or Membership – FREE! Give Us Your Best Social Media Story. Darim has stuck up a deal with the Nonprofit Technology Network, otherwise known as NTEN. NTEN is a valuable central destination for all things nonprofit technology related — webinars, conferences, CRM, CMS, social media, video, marketing, communications, strategy, etc. Membership is not expensive, and incredibly valuable. As a way to help the Darim community learn about and take advantage of NTEN, Darim and the Jewish Communal Service Association are partnering with NTEN to solicit your best stories. We want to know how you are using social media, and what the outcomes have been. This contest is open through April 1. On April 1 we will announce the winners. Prizes include FREE REGISTRATION FOR THE NTEN CONFERENCE in San Francisco, April 26-28 (winner is responsible for transportation and hotel) – valued at $649; free one year membership with NTEN for your organization – valued up to $200; and a free private tutorial or consultation with Darim staff via phone or webinar – priceless! (First place winner gets their pick). Submit your story by posting it in the comments on this blog post by April 1 (or, if you prefer, you can email us). Please make sure to tell us who you are, your role, your organization, what tool you’re using, how you’ve used it, and what the outcomes have been (data, anecdotes and reflections are all welcome). Let’s hear what you’ve got! The Center for Social Media is hosting the 5th annual Making Your Media Matter conference — a perfect opportunity to learn and share cutting-edge practices for creating media that matters. Held at American Universitys Katzen Arts Center in Washington, DC February 12-13, the conference brings together filmmakers, non-profit communications leaders, funders, and students to share and learn about using the latest tools and trends in creating, distributing, and fundraising for social issue media. Danny Alpert, a producer at See3 and others will be speaking in a number of panels. The best part? Only $100! ($50 for students). If you’re going, let us know so the Jews can get together!